Made of high-quality polycarbonate. These windshields are designed to look sharp and stay flexible in extreme cold. They range from clear to black with flames. Finishes include a chrome look, just shiny or with a matte finish. Easy install. 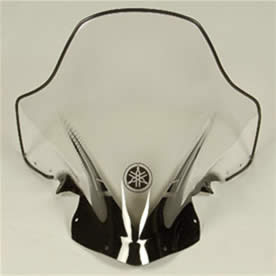 View FX Nytro windshields, wind deflector kits, storage bags and more on our snowmobile accessories pages. View FX Nytro parts and microfiche on our our Yamaha parts pages.